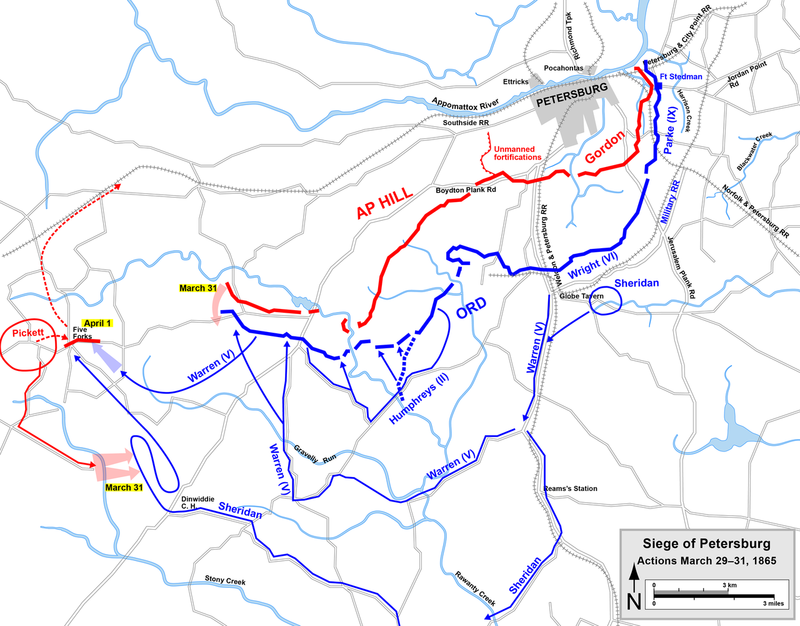 The next day, March 30th, we had made sufficient progress to the south-west to warrant me in starting Sheridan with his cavalry over by Dinwiddie with instructions to then come up by the road leading north-west to Five Forks, thus menacing the right of Lee’s line. This movement was made for the purpose of extending our lines to the west as far as practicable towards the enemy’s extreme right, or Five Forks. The column moving detached from the army still in the trenches was, excluding the cavalry, very small. The forces in the trenches were themselves extending to the left flank. Warren was on the extreme left when the extension began, but Humphreys was marched around later and thrown into line between him and Five Forks. My hope was that Sheridan would be able to carry Five Forks, get on the enemy’s right flank and rear, and force them to weaken their centre to protect their right so that an assault in the centre might be successfully made. General Wright’s corps had been designated to make this assault, which I intended to order as soon as information reached me of Sheridan’s success. He was to move under cover as close to the enemy as he could get. Something for the weekend. God Save the South. Written in 1861 by George Henry Miles, it served as the unofficial national anthem of the Confederacy. Strong religious fervor helped sustain the Confederates through four bloody years, just as it would sustain them in the defeat they were about to endure one hundred and fifty years ago. In Chicago about June or July of that year, when all the facts were fresh in my mind, I told them to George P. A. Healy, the artist, who was casting about for a subject for an historical painting, and he adopted this interview. Mr. Lincoln was then dead, but Healy had a portrait, which he himself had made at Springfield some five or six years before. With this portrait, some existing photographs, and the strong resemblance in form of [Leonard Swett], of Chicago, to Mr. Lincoln he made the picture of Mr. Lincoln seen in this group. 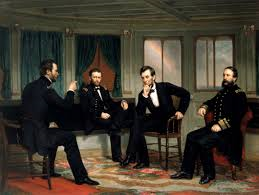 For General Grant, Admiral Porter, and myself he had actual sittings, and I am satisfied the four portraits in this group of Healy’s are the best extant. 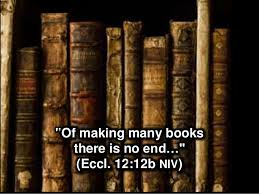 The original picture, life-size, is, I believe, now in Chicago, the property of Mr. [Ezra B. McCagg]; but Healy afterwards, in Rome, painted ten smaller copies, about eighteen by twenty-four inches, one of which I now have, and it is now within view. I think the likeness of Mr. Lincoln by far the best of the many I have seen elsewhere, and those of General Grant, Admiral Porter, and myself equally good and faithful. I think Admiral Porter gave Healy a written description of our relative positions in that interview, also the dimensions, shape, and furniture of the cabin of the “Ocean Queen”; but the rainbow is Healy’s—typical, of course, of the coming peace. In this picture I seem to be talking, the others attentively listening. Whether Healy made this combination from Admiral Porter’s letter or not, I cannot say; but I thought that he caught the idea from what I told him had occurred when saying that “if Lee would only remain in Richmond till I could reach Burkesville, we would have him between our thumb and fingers,” suiting the action to the word. It matters little what Healy meant by his historic group, but it is certain that we four sat pretty much as represented, and were engaged in an important conversation during the forenoon of March 28, 1865, and that we parted never to meet again. The original painting was destroyed in a fire, and what we have now is a copy found in 1922, lying forgotten in a family storehouse in Chicago. Harry Truman, ironically a proud card carrying member of Sons of Confederate Veterans, purchased the copy of the painting for the White House in 1947. The railroad was repaired to Goldsboro’ by the evening of March 25th, when, leaving General Schofield in chief command, with a couple of staff-officers I started for City Point, Virginia, in a locomotive, in company with Colonel Wright, the constructing engineer. We reached Newbern that evening, which was passed in the company of General Palmer and his accomplished lady, and early the next morning we continued on to Morehead City, where General Easton had provided for us the small captured steamer Russia, Captain Smith. We put to sea at once and steamed up the coast, reaching Fortress Monroe on the morning of the 27th, where I landed and telegraphed to my brother, Senator Sherman, at Washington, inviting him to come down and return with me to Goldsboro. We proceeded on up James River to City Point, which we reached the same afternoon. I found General Grant, with his family and staff, occupying a pretty group of huts on the bank of James River, overlooking the harbor, which was full of vessels of all classes, both war and merchant, with wharves and warehouses on an extensive scale. The general received me most heartily, and we talked over matters very fully. 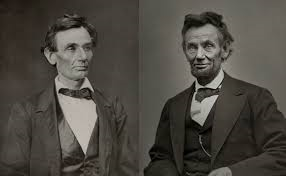 After I had been with him an hour or so, he remarked that the President, Mr. Lincoln, was then on board the steamer River Queen, lying at the wharf, and he proposed that we should call and see him. We walked down to the wharf, went on board, and found Mr. Lincoln alone, in the after-cabin. He remembered me perfectly, and at once engaged in a most interesting conversation. He was full of curiosity about the many incidents of our great march, which had reached him officially and through the newspapers, and seemed to enjoy very much the more ludicrous parts-about the “bummers,” and their devices to collect food and forage when the outside world supposed us to be starving; but at the same time he expressed a good deal of anxiety lest some accident might happen to the army in North Carolina during my absence. I explained to him that that army was snug and comfortable, in good camps, at Goldsboro’; that it would require some days to collect forage and food for another march; and that General Schofield was fully competent to command it in my absence. Having made a good, long, social visit, we took our leave and returned to General Grant’s quarters, where Mrs. Grant had provided tea. While at the table, Mrs. Grant inquired if we had seen Mrs. Lincoln. “No,” said the general, “I did not ask for her;” and I added that I did not even know that she was on board. Mrs. Grant then exclaimed, “Well, you are a pretty pair!” and added that our neglect was unpardonable; when the general said we would call again the next day, and make amends for the unintended slight. Early the next day, March 28th, all the principal officers of the army and navy called to see me, Generals Meade, Ord, Ingalls, etc., and Admiral Porter. At this time the River Queen was at anchor out in the river, abreast of the wharf, and we again started to visit Mr. and Mrs. Lincoln. Admiral Porter accompanied us. We took a small, tug at the wharf, which conveyed us on board, where we were again received most courteously by the President, who conducted us to the after-cabin. After the general compliments, General Grant inquired after Mrs. Lincoln, when the President went to her stateroom, returned, and begged us to excuse her, as she was not well. We then again entered upon a general conversation, during which General Grant explained to the President that at that very instant of time General Sheridan was crossing James River from the north, by a pontoon-bridge below City Point; that he had a large, well-appointed force of cavalry, with which he proposed to strike the Southside and Danville Railroads, by which alone General Lee, in Richmond, supplied his army; and that, in his judgment, matters were drawing to a crisis, his only apprehension being that General Lee would not wait long enough. I also explained that my army at Goldsboro’ was strong enough to fight Lee’s army and Johnston’s combined, provided that General Grant could come up within a day or so; that if Lee would only remain in Richmond another fortnight, I could march up to Burkesville, when Lee would have to starve inside of his lines, or come out from his intrenchments and fight us on equal terms. Grant, a failure all of his life except for war, marriage and his last valiant race with the Grim Reaper to finish his memoirs and provide for the financial security of his family; seemingly a dull plodder, but possessed of iron determination and an uncanny ability to never let the trees obscure the forest; happily married and a firm believer in God, but subject to bouts of depression when he would grasp for the bottle; the shabby little man who won the greatest war in American history. “Fire your gun, sir.” He at once called to his kind- hearted foe and said : ” Hello, Yank ! Wake up ; we are going to shell the woods. Look out; we are coming.” And with this effort to satisfy his conscience and even up accounts with the Yankee picket, he fired the shot and rushed forward in the darkness. As the solitary signal shot rang out in the stillness, my alert pickets, who had crept close to the Union sentinels, sprang like sinewy Ajaxes upon them and prevented the discharge of a single alarm shot. Had these faithful Union sentinels been permitted to fire alarm guns, my dense columns, while rushing upon the fort, would have been torn into fragments by the heavy guns. Simultaneously with the seizing and silencing of the Federal sentinels, my stalwart axemen leaped over our breastworks, closely followed by the selected 300 and the packed column of infantry. Although it required but a few minutes to reach the Union works, those minutes were to me like hours of suspense and breathless anxiety ; but soon was heard the thud of the heavy axes as my brave fellows slashed down the Federal obstructions. The next moment the infantry sprang upon the Union breastworks and into the fort, overpowering the gunners before their destructive charges could be emptied into the mass of Confederates. They turned this captured artillery upon the flanking lines on each side of the fort, clearing the Union breastworks of their defenders for some distance in both directions. Up to this point, the success had exceeded my most sanguine expectations. We had taken Fort Stedman and a long line of breastworks on either side. We had captured nine heavy cannon, eleven mortars, nearly 1000 prisoners, including General McLaughlin, with the loss of less than half a dozen men. One of these fell upon the works, pierced through the body by a Federal bayonet, one of the few men thus killed in the four years of war. I was in the fort myself, and relieved General McLaughlin by assuming command of Fort Stedman. general advance. The breaking down of the trains and the non-arrival of these heavy supports left me to battle alone with Grant’s gathering and overwhelming forces, and at the same time to draw in my own lines toward Fort Stedman. A consuming fire on both flanks and front during this withdrawal caused a heavy loss to my command. Few generals in American history have been as aggressive as Robert E. Lee. Faced with a hopeless military situation in March of 1865, he decided that he had no alternative but to launch an attack. His starving army was down to 50,000 men, and with the lines around Petersburg and Richmond so extensive, when Grant began to move with an army nearly three times the size of Lee’s it did not take a military genius to realize that he would break Lee’s lines. However, if Lee could break Grant’s lines first, it might buy Lee time. 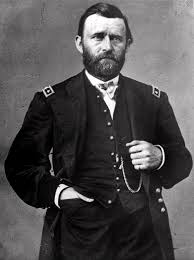 Grant would perhaps consolidate his lines around the breakthrough and delay his Spring offensive. 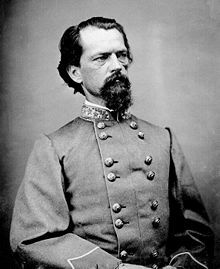 That might give General Joseph E. Johnston sufficient time to march up ahead of Sherman from North Carolina and link up with Lee. 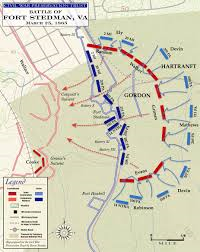 At that time Lee could attempt to defeat Sherman and then Grant seriatim. The plan relied far too much on hopes and wishes, but other than surrender, it was the best of the bleak options facing Lee. Something for the weekend. A medley of Civil War songs, Tenting on the Old Camp Ground, Johnny Has Gone For a Soldier and The Dying Soldier, sung by the choir of my bride’s alma mater, Concordia College of Morehead, Minnesota. Go Cobbers!